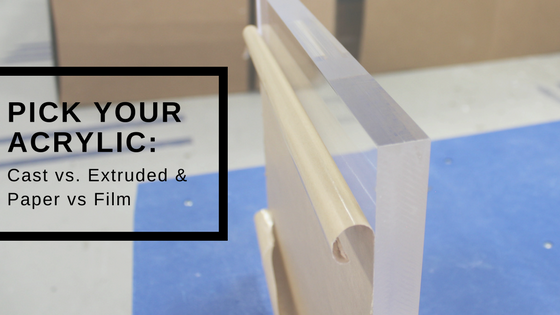 Are you thinking about purchasing acrylic and then have the question of cast or extruded pop up? What about choosing between paper and film? Here is guide to help you decide which is the best one for your project. Cast acrylic is created when the acrylic liquid is pumped in between a mold of two pieces of glass and submerged in warm water. This manufacturing method allows for smaller batches than the extruded material. Therefore, most of the colored or textured acrylic that you see is probably cast acrylic. Extruded acrylic is created when the acrylic liquid is pushed through a form. The direction in which it is extruded can later affect fabrication. Colors Can be produced in many different colors and thicknesses More limited color selection than cast. Heat Bending More difficult to bend or shape Easier to bend or shape, but it will behave differently depending on the bending direction and the direction of the extrusion. Cutting Cleaner edge Edge is not as clean, and edges can look different depending on the direction of the extrusion. Every sheet of acrylic comes with a protective film or paper covering it, and depending on your project, one option can be preferable over the other. 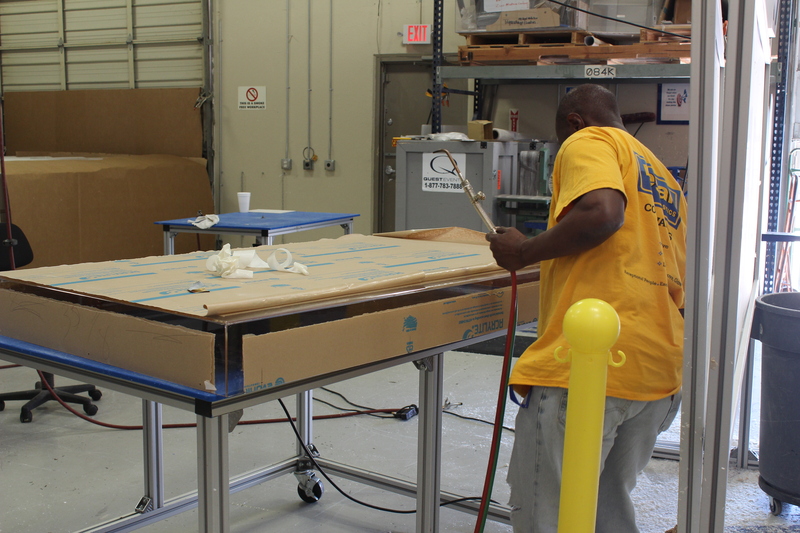 Our fabrication department and customers prefer the paper backing when CNC machining or fabricating acrylic. The paper gives you the option to peel it back a few inches or remove the paper from different sections that you are working on while leaving the rest of the material protected against damage. If you are CNC machining, paper is a necessity as film can become caught on the CNC machine and cause damage. Here is a prime example of our fabrication department removing or peeling back the paper from areas they are flame polishing. The rest of the material stays covered and protected from damage. Anyone that has ever had to peel the paper off several sheets of acrylic can attest to how much time it can take. Removing film is a much easier and less time consuming. This makes it a better option for people handling a large number of acrylic sheets that will be installed with minimal fabrication. Do you have an upcoming acrylic project or have plastics questions? Reach out to one of our sales representatives or technical specialists. We will gladly answer any of your questions so you can be confident you get the right plastic for your project.